THE STORY OF THE IMPACT of a group of Vassar women trustees and professional social scientists on the vulnerable, receptive, and eager Henry Noble MacCracken between 1915 and 1925, in his early stage of formulating and executing his forward-looking academic policies, revolves around a floating, much misunderstood, and (to some on the faculty at the time) alien idea. It called for modernizing women's liberal arts education and training women in a scientific and interdisciplinary way for a life of active citizenship and community participation. The objective of skill in community participation was not at all unfamiliar to the Vassar alumna: from Maria Mitchell's day on, Vassar graduates made themselves known and did things in their communities. But the way this new interdisciplinary program was supposed to lend itself to the established curriculum rankled too many of the faculty at the time for it to be thoroughly successful. The sewage from the College [was] carried through pipes to the ravine, four hundred feet east of the building, and there discharged into a large covered brick tank, from which, after the settling of the more solid portions, the comparatively clear liquid [was] conveyed through sewer-pipes underground nearly two thousand feet, before it [was] discharged into the united Casper Kill and Mill-Cove Brook. The portion retained in the tank, rich in phosphates and other fertilizing elements, being then drawn off into the muck-heaps prepared to receive it, [was] at :once deodorized and converted into a valuable manure. This is a valuable record of the possibility of sewage utilization without offense, and of the right principle in taking care of the wastes of an establishment by itself, instead of fouling a stream, to become a menace to the health of others, and an expense to helpless dwellers further down. It is thus in the line of modern economic and sociological investigation, a line which must be followed up if the land is to remain safely habitable. This professional intervention of Richards into questions about Vassar's sewage disposal was an example of the application of technology to a practical community problem, in this case Vassar's pollution of waters passing through other neighboring properties. Richards was able to solve the problem because of her understanding of public health and water pollution problems, gained at the Massachusetts Institute of Technology. M.I.T. did not call the discipline she practiced "euthenics." But Richards did. "Euthenics" was a word she herself had coined from the two Greek stems, eu, well; the, root of tithemi, to cause. Hence the word "euthenics" meant to be in a good state. Richards began the foreword of her book Euthenics, the Science of Controllable Environment, originally published in 1910, with these words: "Not through chance, but through increase of scientific knowledge; not through compulsion, but through democratic idealism consciously working through common interests, will be brought about the creation of right conditions, the control of the environment. " Having entered Vassar at age twenty-six in 1868 and graduated two years later in 1870. Richards was, in 1894, a scientist of note, specializing in water pollution and the quality of water as a resource. On her twenty-eighth birthday her application to enter M.I.T. (founded for men five years earlier) had been accepted and she was admitted as a special student without charge, a device around the fact that she was a woman and that the institute was chartered to accept only men. In 1884 M.I.T. had established a separate laboratory for "sanitary chemistry" the first in the world, and Richards became its head. The laboratory carried out water testing and analysis for the state of Massachusetts from 1884 to 1897, when it was replaced by a laboratory opened in the state house. Richards was concurrently employed by the state to examine and report on foods. She paved the way for women to become engineers at the institute, and later became its first dean of women, advising them about their programs and careers. When she married Robert H. Richards, who was a mining engineer in the first class at M.I.T. she went with him on their working honeymoon to Nova Scotia, dressed in field equipment, wearing short skirts and heavy boots, and ready for scientific exploration. Under her leadership, too, the new discipline of "home economics," one aspect of many in the larger field of euthenics, came into being at a meeting in Lake Placid in 1899. The concept of "home economics" had broad implications for the American home and family. It was much different from the simpler notion of "domestic economy" promulgated by Matthew Vassar in his 1868 speech. It concentrated on the "management of the home on economic lines as to time and energy as well as money." Like the broader term to which it was now linked— "euthenics, the science of controllable environment"— the home economics concept envisioned environmental reform through concentration on application of scientific principles to the protection of air, water, and food, and the elimination of pollutants of the environment. Richards believed that the future quality of life lay in the hands of parents of children, and of those children turned adults, who, having been brought up with applied scientific awareness, would raise the level of the environment through management of these basic resources for the good of the whole. By and large, however, her movement failed to have an impact in the right quarters at the time. As Marcia Yudkin said in The Vassar Quarterly, "her broad definition of the environment failed to catch on." Yudkin explained that the outdoors was considered man's sphere: the Ecological Society of America, founded in 1911 by male scientists, largely "ignored her contribution." Yet Richards and her theories and practice had not been ignored at all by certain advocates among the Vassar alumnae, nor by the women's networks that were growing up among collegiate alumnae at large. Beginning with Maria Mitchell, Richards's undergraduate astronomy professor at Vassar, who invited her as a distinguished alumna to speak to a woman's group in Poughkeepsie, many women who were listening had a keen sense of her contributions to reform in the sciences and her interest in the potential for interrelated development of the social sciences and the applied sciences. Lucy Maynard Salmon, who had arrived at Vassar only after Richards had graduated, had separately come to conclusions somewhat akin to hers in pursuing systematic historical research into the subject of domestic science. Louise Fargo Brown, in her book Apostle of Democracy, the Life of Lucy Maynard Salmon comments in connection with the publication of Salmon's book, Domestic Science in 1891, which preceded Richards' book by eighteen years, that it was the "first scientific study that had ever been made of the subject and was immediately acclaimed." By sending out questionnaires and gathering information, of which they then analyzed the results, her students found out what went on in the great households of the wealthy gentry in America in the nineteenth century. Information was collected about the economics of the household: the pay of servants; working conditions; housing conditions; use of leisure; the description of tasks; and employer-employee relationships. The book, a "scientific study," was the result of that research. Richards was dead by the time MacCracken arrived on the scene. But the speakers at his inauguration were worthy protagonists of her cause and had taken him by storm. In his later years when MacCracken wrote The Hickory Limb, he recalled that Lillian Wald's speech at the Fiftieth Anniversary celebration of the college had hit him "like the sound of a trumpet" as he sat in the audience that day. She spoke of the growth in her time of "a new consciousness" in women, which she linked to the fight for suffrage in that it was part of the evolution of self-government. As a result [of this new consciousness], many more women than ever believe that they can best represent themselves in those measures that immediately concern them and for which tradition and experience have fitted them. Julia Lathrop who also gave a clarion call for a new educational agenda at MacCracken' s inauguration, had first addressed the returning alumnae on the subject of euthenics at a meeting in the Assembly Hall on campus two years earlier in June 1913. Just before the meeting, she encountered one of her classmate friends, Louise Stanwood, in the hall of Main Building and made modest disclaimers about whether her speech would be worth listening to. Stanwood met her again the next day and asked her what the reception of her speech had been. Lathrop said she didn't know about the impact on alumnae in general, but that one alumna in particular had taken her aside and expressed great interest in and support for what she had to say. Over a private dinner that evening, perhaps at the Wagner Inn near the campus, a spot where returning alumnae tended to gather for sociability—Julia Lathrop and the supportive alumna, Minnie Cumnock Blodgett, hatched a plan to press for redirecting and reinvigorating certain aspects of the curriculum at Vassar with the development of an interdisciplinary program in euthenics, which would be an add-on, and would include a new amalgamation of courses from the applied sciences, arts, and social sciences, directed towards solving problems involving the betterment of human life in the home, in society at large, and in the environment. Inventor of the birth certificate and heir-apparent of Richards' ideas after her death in 1910, Julia Lathrop was one of Vassar's most distinguished alumnae and the first woman in the country to be appointed to a position as a governmental bureau chief. President William Howard Taft asked her to be the head of the U.S. Children's Bureau of the U.S. Department of Labor in 1912, a position to which she was reappointed under two succeeding U.S. presidents, before retiring in 1923. In her seminal 1913 speech to the alumnae, Lathrop mentioned that the first difficulty she had encountered in the Children's Bureau was the lack of documentation. "We do not pay enough attention to ourselves in this country to know how many of ourselves are born." She continued that "in only eight states were the statistics sufficiently accurate to enable the Bureau to carry on its investigation." Lathrop's first move as chief of the bureau was to launch comprehensive surveys of infant mortality, procedures which resulted in a summary of the results in The New York Times of February 7, 1915, under the caption "Poverty Kills 300,000 Babies Yearly." During the course of her subsequent career in government, Lathrop initiated and supervised many new approaches to child welfare, especially with the implementation and passage of laws against child labor, the establishment of juvenile courts, and the improvement of management of institutions affecting the lives of children and parents. Lathrop told The Chicago Sunday Record Herald in 1912, the year she was appointed to her government position, that she had had to invent her disciplinary training; there were no such studies as statistics, sociology, institutional history, and training in community organization when she was in college. History as she had been taught it (before Lucy Maynard Salmon's time at Vassar) was "dry as dust and without purpose.... You cannot get the right sort of government till certain types are trained for it, as we are training young men now for the consular service. We need orderly training for those going into public work." It was this missing interdisciplinary training for work in the complex contemporary social environment, either in paid or voluntary positions—or simply in scientific household management—that prompted Lathrop's interest in persuading the new president to establish a program in euthenics. Minnie Cumnock Blodgett and Julia Lathrop were a formidable team. Blodgett, based on her own experience, thought that women in general, including college graduates in her generation and afterwards, too often lacked access to information necessary to child nurturing and family welfare. She had herself nearly lost her first baby, she said, through ignorance of infant feeding. "Although I had a classical education and was a college graduate, I had no information whatever along the lines of motherhood and child training." In 1908 she had founded clinics for infant feeding in her native city of Grand Rapids, Michigan. "That led to reconstructive community problems such as the re-writing of the milk ordinance, advocating of more school nurses, interest in playground movements and city housing schemes." 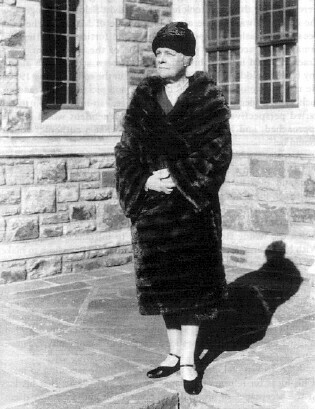 Blodgett, together with her husband, John Wood Blodgett, was in a position to offer financial support to begin a program of euthenics at Vassar, which would address these growing problems of contemporary society and offer women graduates an opportunity to tackle them professionally or on a voluntary basis after graduation. MacCracken had not run into the concept of "euthenics" as such before his exposure to these determined women. Nevertheless, the philosophy of social science and activist reform that it represented, and that they advocated, was entirely familiar. His father, Chancellor MacCracken, had imbued his children with the idea that college undergraduates during their educational experience should be actively concerned about social betterment of the community. The elder MacCracken had made it clear in his inaugural address in 1884, entitled "Relation of Metropolis and University," that the city university and the city were mutually dependent on each other. Through the informed study of social statistics, students could feed results into a reservoir of information useful for the development and carrying out of social policy for reform. To that end, for example, the older MacCracken instituted a course in sociology to be required of sophomores at New York University around the turn of the century—a course in which students would begin to learn what the urban community around them was like, how it functioned, and how it could be made better. He was at this time an officer of the American Institute of Social Service, which prepared an annual Baedeker of social progress in New York City. In a newsletter for 1903, the institute indicated that it would that year publish statistics about labor unions, arbitration, child labor, civil service, cooperation, divorce reform, housing problems, social settlements, wages, public ownership, institutional churches, and education. So the general field of community planning was a concept familiar to the younger MacCracken as he exchanged views with his father during the period of his own undergraduate education at New York University and in the early years of his own presidency. MacCracken soon decided that euthenics was a viable framework through which to put forward a new educational mission for the college and that the time was ripe for such a fresh emphasis. He believed that the offering of the multidisciplinary subject of euthenics would add new purpose to the Vassar curriculum and would usher in a new day in education, a new way for women to link their undergraduate training with professions undertaken after they graduated. He was not thinking of this program as a requirement, or as universally appealing to all students. The regular disciplinary curriculum would continue to develop and expand through normal channels as well. But a program in euthenics would provide one distinctive and direct medium for the student to equip herself for a life of service in the postwar community. There were others. [E]uthenics is coming to mean the immediate conditions of physical well being; hygiene, physical and mental; sanitation and public health, preventive medicine and social work, and the contribution of the arts to the same immediate end. He continued, saying that the rapid advance of applied science, such as the kind given in these examples, was jeopardizing the inherent value of pure science, which was in danger of being forgotten in America. The pure and applied sciences, the social sciences, and the pure arts and the applied arts must foster each other, not compete with each other. This would be achieved when they were taught as one interdisciplinary subject, with many disciplines interrelating with each other to make up the field. DURING THE COURSE of the Alumnae Association study of college programs to meet new needs in women's post-graduate lives— the study headed by Mrs. Blodgett—MacCracken took a daring leap forward. In May 1922 he proposed the establishment of a euthenics program to the faculty. He handled his introduction of the idea in a curious (and probably harmful) fashion, however, first summoning the faculty to a special meeting, and then putting the meeting in charge of a temporary chairperson, as he himself would be out of town on the particular date. It looked to many as if he were afraid to commit himself. No one on the faculty was really enthusiastic about the idea, and many members actively opposed it in the debate that ensued. No action was taken that day, however, except to table the discussion until fall. Why he went about his purposes in this fashion, especially after he had put such emphasis on the faculty's prerogative in curriculum-building and self-government, is a question that may never be answered. Looking back, it can be surmised that he anticipated heavy criticism from the faculty—which he got—and that he thought it could best be deflected by an oblique introduction, and a waiting period. Since the Vassar faculty had only recently gained control over educational policy, MacCracken certainly might have predicted that they would not give it away so freely to a coalition of the alumnae. The following fall was the one during which MacCracken was on leave for a semester visiting eastern European universities. Acting president George Nettleton, a trustee of Vassar, who was MacCracken's former colleague at Yale University, probably in keeping with the same stalling purpose, did not raise the issue in MacCracken's absence. The matter was introduced again, however, in due course—this time at a curriculum committee meeting in April 1923 when MacCracken had returned from his leave. This time he was present, and he reported to the committee that there was a gift in the offing of $250,000 for a euthenics building. He recommended the recognition of a group of courses called "euthenics," which would comprise that field of study that "considers the improvement of social and physical conditions by conscious application of the arts and sciences." Many of the courses were already in the curriculum, he noted, already offered by various departments as part of their discipline. Some would be created anew—such as nutrition, applied physiology, and new courses in child psychology—to supplement the single course on the subject already taught in the psychology department. By and large, MacCracken indicated, the euthenics program would be a revamping and restructuring of subject matter already in the curriculum to concentrate on complex social problems of contemporary society. The students would learn how to think about them, and actively deal with them. MacCracken emphasized that euthenics was but one optional opportunity in a large and flexible curriculum: it would not replace anything. Still the faculty was only lukewarm. Following that curriculum committee meeting, he recommended to the appropriate trustee committee that Mrs. Blodgett's offer of a gift for the purpose of housing euthenics be accepted. (The acceptance of buildings was a trustee concern, over which the faculty had no control.) The building, as designed, would provide space for the department of physiology and hygiene, as well as research rooms and laboratories which could be used in cooperation with the psychology department and zoology department. There would be provision also for a social museum, with plenty of space for exhibitions concerning the researches of the euthenics program—the impact of planned change and problem-solving on communities, the documented history of the need for change, and the study of change in particular instances. This trustee committee in 1923, as it happened, stalled and voted to defer deliberations, presumably until the faculty had spoken. The program may well have sounded too vocational in educational thrust to some on the board. It is hard to know whether they were worried about the radicalism of the "application" aspect of the program, or about the negative reaction of the faculty to this new idea, or both. At a subsequent meeting of the faculty, where discussion of the issue was to be continued, MacCracken was again absent, sick in bed. (In retrospect, three absences from a total of four meetings seems to indicate MacCracken had lost his nerve, caught between opposing positions.) In his absence, the euthenics idea was attacked by its opponents at this meeting. They said it was vague, not scholarly, and contained courses not worthy of study. It threatened to return women to domesticity, and again shut women's doors to the outside world, which had only just been pried open. But the president, anticipating that there would be unfavorable criticism, guessing what it would be, and perhaps thinking that he could be more persuasive and better ward off the attack on paper than in person, had sent along a letter to be read at the meeting. In the letter, he explained that euthenics was no vaguer a term than sociology, or anthropology, or psychology. He insisted that his own interest in euthenics had preceded Mrs. Blodgett's, and then—not too subtly—he added that she helped raise the money for their salaries (the million dollar endowment that the college received from an alumnae drive in 1917). He notified the faculty that he was going to recommend to the trustees at their June meeting that they accept the building, together with an endowment from the Blodgetts to keep it up. The implication was that it would be a shame to accept the building without having accepted the program tailored to go in it. Euthenics squeaked through the faculty vote by a narrow margin in June 1924, and became an option in the undergraduate curriculum the next year. It set up certain applied and multidisciplinary courses, such as nutrition and child psychology, and linked a few departments in disciplinary experiments. But it fell far short of the rather grandiose reform notion on which it was predicated—that of preparing students across the board for a better society. Not many students braved the general opposition of the majority of the faculty to what some considered to be a fringe experiment. The publicity surrounding the introduction of the program called a great deal of attention to it in alumnae circles, but the undergraduates, with a modest number of exceptions, scarcely considered it, except for availing themselves of the opportunity to take child-study, the single aspect of the program which attracted general interest. Some members of the Vassar faculty thought the whole movement had been railroaded through and never forgave MacCracken for getting Vassar involved with euthenics. Badly as she needed space for her psychology students, Margaret Floy Washburn, partisan to MacCracken when he first came, refused to move her psychology laboratory, for which she had invented both equipment and concepts, out of its quarters in Vassar Brothers Laboratory, the ancient out-of-date science building. She stubbornly hung on until her retirement and would never cross the threshold of Blodgett Hall of Euthenics after it was opened in 1931. She believed that euthenics was neither a science nor a social science, and she thought it did not belong in the Vassar curriculum. (When he wrote The Hickory Limb in 1950, MacCracken could make light of the situation in which he had found himself in the 1920s. He quoted Washburn, "'You are driving women back into the home, from the slavery of which education has helped us escape, Dr. MacCracken.'") Mabel Newcomer, a distinguished economist with an office in the same old building as Washburn's, didn't want to leave for Blodgett either, and stayed in Vassar Brothers until it was razed in 1936. There were quite a few other holdouts like these. MacCracken did not see his program as returning women to domesticity and thought that as it expanded it would liberate them to have an enhanced impact on social change and to improve the quality of lives in home, community, nation, and on the globe. While the program continued as a viable major for more than a decade, the only part of it that ever took hold was Child Study, which, after a few years became a separate major and remained so until 1965, long after MacCracken had retired, when it was assimilated by the psychology department. Since it seemed fairly clear that euthenics was not going to thrive among more than a handful of undergraduates in any given year, MacCracken and the alumnae trustees decided to introduce a variant of it as summer adult education, an idea forwarded also by Blodgett's committee. The first summer school of euthenics took place in 1926, and the summer school program continued until 1959, thirteen years after MacCracken's retirement. Participants included, but were not limited to, Vassar alumnae, and were taught by a faculty, with members from both Vassar itself and other institutions, especially Sarah Lawrence, which as we shall see, was MacCracken's substitute venture into the field of experiential education, conceived as his earlier dreams for a modern program of euthenics at Vassar itself aborted. The open curriculum of the summer institute addressed such subjects as social welfare, nutrition, child psychology, early childhood education, and psychiatry. Its concentration on contemporary questions, problems, and attitudes of American culture, and specifically on the American family, served to focus the attention of those on the campus each summer on the value of working positively at questions by the give-and-take methods of an institute, and of arriving at good solutions. Eleanor Roosevelt sometimes slipped into the sessions and even taught for one week. In 1942 the often misunderstood term euthenics was temporarily dropped from the title of the institute, which was renamed "The Vassar Summer Institute for Family and Childcare Services in Wartime." It gained new importance during World War II as one of several war institutes sponsored by the state and federal government. Later, it resumed its previous title. The building with a purpose was elaborately designed by the firm of York and Sawyer. It was a one-of-a-kind edifice, with sections reserved for various aspects of the euthenics program. Unfortunately the space-hungry college could not afford its elegant luxury and it was soon adapted to more generalized use. One section of the building, however, which had been planned to be devoted to the household arts and interior design—the most objectionable part of the program to some—was used to house an experiment in cooperative living throughout the years of the depression. And the space of the Social Museum, a modern gallery for visual presentations of research in the social sciences, was used quite broadly by departments in the social sciences and the arts for several decades. When Eleanor Roosevelt and Harold Ickes participated in a symposium at Vassar on municipal housing in 1937, an exhibition of materials on housing was displayed in the Social Museum. In 1931 MacCracken hired a sociologist, Joseph Folsom, to replace the retiring Herbert Mills, professor of economics (and sociology). By 1936 Folsom had developed an academic program in field work in the social sciences, which was reported as thriving in the published "President's Report to the Trustees" in October, 1936. Folsom, two years later to become president of the Eastern Sociological Society, by then was teaching several courses which based the students out in the community—one of the courses was entitled "The Community," and another was "Seminar in Social Problems." Students taking the seminar were doing research theses in such areas as "Social Mapping of Communities," "Mapping of Social Phenomena," "House to House Surveys," "Studies of Social Agencies and their Functions," "Studies of Individuals and their Families," and "Studies of Nationalities and Racial Groups." Folsom cited as objectives for this field work that "education in the social sciences [should] be made more vital and [should] prepare students with both the knowledge and the enthusiasm to serve their own communities as leaders... that the college [should] serve the community around it and make information researched available for community leaders" and "that the program should also serve to educate the general public in principles of social science and promotion of social-mindedness." He noted that the implicit danger in such a program was that the community might reject its intellectual paternalism as snobbery and elitism. The broader Folsom expansion, as it might be called, was more popular with students than the original euthenics courses. (These were clearly all courses which might have been included in the original program, but were not. Had they been available five years earlier, the narrowness of focus of the earlier program would have been avoided, and the amplified program perhaps would have sharply altered the Vassar curriculum.) The euthenics program did not jell into the initial mold planned, and MacCracken could only have been disappointed that his first venture in curricular innovation had not been much of a success. But within the next two decades in his administration many of the ideas latent in the program cropped up again when the times were ready for them and took hold. The activist field work program of the college, always in the air from the time of Maria Mitchell on, became increasingly important during the forties and fifties and remained an accredited permanent part of the curriculum. MacCracken would in 1925 immediately have been at ease with almost any of the multidisciplinary courses taught in the college of the 1990s. He might have opened a 1990 catalogue and picked one at random, such as: "Perspectives on the Global Village," an introduction to the varied perspectives from which an interdependent world can be approached, and have uttered: "Ah, just what a euthenics course should be!" A major problem in the aborted curricular life of euthenics was that it came too early to a traditional faculty which had just gained autonomy over its own role in developing single disciplines and was not ready for a multidisciplinary approach. And it came as a conspicuous outcome of alumnae and administrative pressure. Perhaps more important than either of these defects was that MacCracken pulled the wrong stops in his campaign to introduce the program. With his instinct for the language, it is puzzling that he chose to make use of Matthew Vassar's imagery about domestic economy in order to impress his liberated modern listeners, calling the program an embodiment of the founder's unfulfilled dream to start a scientific program in domestic economy and erect a building to house it. He tried to graft a futurist movement onto a concept whose time was past: the term was too old-fashioned for the 1920s undergraduate or faculty member, emitting vibrations of "domesticity" instead of "community organization." MacCracken had already succeeded in rapidly executing so many of his ideas for reform and change in those early years, that his loss on the acceptance of an academic program of euthenics was disappointing and unexpected. Fortunately he was involved with many other progressive curricular changes which did succeed from 1923 to 1928, instituted through the modernized procedures and carried out as part of the faculty's overall charge. Those changes were overseen, with his enthusiastic cooperation, by the efficient new dean, C. Mildred Thompson, whom he chose in 1923. So the forward movement of the curriculum transpired, in spite of the initial setback. In fact, in due course, many of the disciplines added to their offerings courses which brought their students to confront the changing contemporary world.